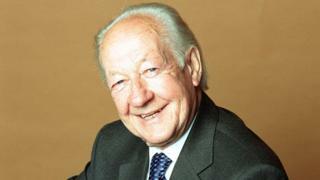 BBC Radio 2 broadcaster Brian Matthew has died, his family has said. Matthew had presented Sounds of the 60s since April 1990. His last full show was broadcast in November 2016, but he returned in February for a final compilation programme. He also presented on TV, fronting ITV show Thank Your Lucky Stars which featured bands including The Beatles and the Rolling Stones. Matthew died on Saturday at the age of 88. Head of Radio 2 Lewis Carnie paid tribute, saying Matthew would be "sadly missed by us all". He was a "much loved and valued presenter on Radio 2 - by both the audience and his colleagues", added Mr Carnie. "He presented Sounds of the Sixties for 27 years and we had hoped to be able to carry on working with him in a new series where he could share his memories from his distinguished career with us," he said. "Sadly it was not to be." Former Radio 2 Controller Bob Shennan paid tribute to his "wit and warmth", adding: "Brian was a radio legend. For decades, his voice was the sound of Saturday mornings... He will be sorely missed." Referring to his on-air sign-off, the station tweeted: "Farewell to your old mate and ours, Brian Matthew." Matthew was born in Coventry to a singer mother and conductor father. It was revealed earlier this week that Matthew was critically ill, after Radio 2 initially mistakenly announced his death. His passing on Saturday morning was confirmed by Radio 2 and by Matthew's god-daughter.